Animals in Entertainment: A Hollywood Ending? “Realistic and…uncanny” was how The New York Times described the animals and tropical foliage in Disney’s 2016 blockbuster The Jungle Book, a remake of the 1960s classic loosely based on the book by Rudyard Kipling. Every one of the 70 species of animal featured in the film was computer-generated using technology, developed during the last two decades, that uses highly sophisticated animation to replicate animals’ images and behavior. This achievement was the result of a collaboration between Disney and movie director Jon Favreau that followed decades of work by People for the Ethical Treatment of Animals (PETA) to shift the climate in Hollywood against the use of animals in film and advertising. During filming, PETA approached Disney to confirm that it was not using live animals, and the company in turn asked PETA to help promote the film and its commitment to using sophisticated animation instead. “The tide is really starting to turn, and Jungle Book more than any movie is the best evidence,” says Dan Mathews, senior vice president of campaigns for PETA, an organization that in the 1980s brought one of the first legal cases exposing animal cruelty in entertainment. 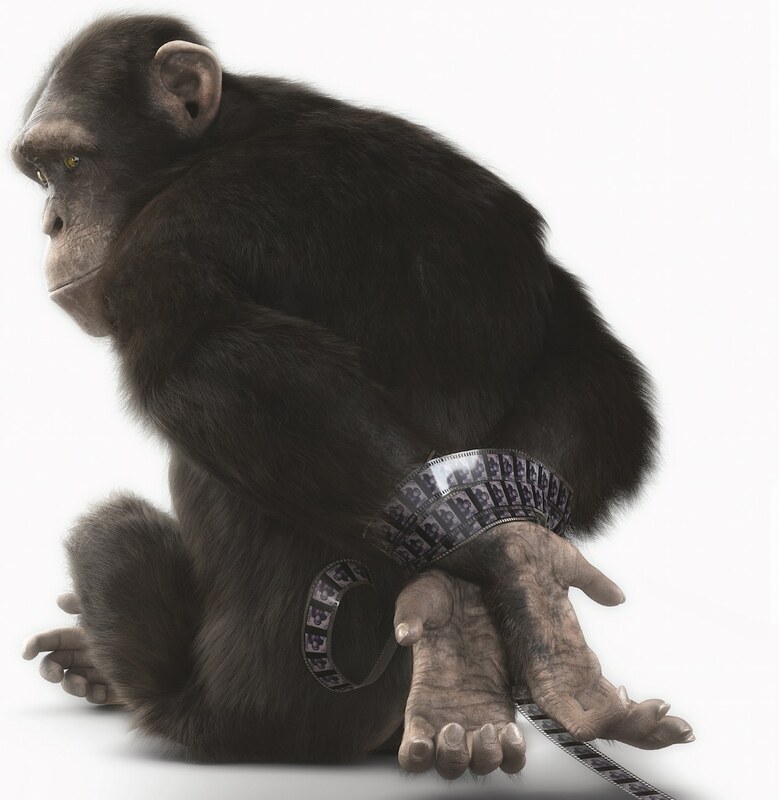 Audiences are usually unaware, says Mathews, that the adorable apes that appear in movies and advertisements have been ripped from their families, live in tiny, solitary cages, and often suffer abuse in the training process. In addition, when they become unmanageable at about the age of seven, they are often given to unregulated and makeshift zoos where they are vulnerable to even greater abuse. “It’s a far cry from where they’re meant to live,” Mathews says. PETA awarded Jon Favreau its 2016 Innovation Award, because he “showed how to use the technology in a way that would grab adults as well as kids so people feel that they’re witnessing live action,” Mathews says. While praising good practices, like those used in the Planet of the Apes films in 2011 and 2014 and in the 2014 film Noah (which broke new ground with the quality of its computer-generated images), PETA educates and lobbies Hollywood directors and producers when they reveal plans to cast live animals. “We pressure studios not to use animals, not just because it’s wrong…but because of specific evidence of cruelty and other violations of the Animal Welfare Act that have been frequently reported,” Mathews says. As soon as a movie production is green-lighted, PETA combs scripts for scenes involving wild animals and reaches out to producers—not all of them sympathetic to the plight of captive animals. When The Wolf of Wall Street proceeded with a brief scene involving a chimpanzee at an office party, PETA protested, as it did with Life of Pi, whose tiger protagonist was trained by a Canadian zoo owner who later resigned from his post as the zoo’s director after being charged with animal cruelty. After a PETA investigation revealed the same trainer bragging that he could carve his initials on a tiger with his whip, the CBS series Zoo, which had also hired him, canceled its contract with the trainer. PETA launched an ad campaign to protest the use of live animals in the CBS television show Zoo. Credit: Created by Michael Stango and Jonathan Hirsch, VCU Brandcenter under the direction of Mike Lear of Erwin Penland, with Hey Beautiful Jerk creating the chimpanzee using computer-generated imagery. In 2015, the last of the top 10 U.S. advertising agencies, as well as national brands like Geico Insurance, pledged not to use great apes in commercials after PETA met and shared with them its video exposé on the abuse of apes in entertainment, hosted by actor Anjelica Huston. “Now when you turn on your TV, you’re much less likely to see chimps,” Mathews says. On June 12, 2015, the U.S. Fish and Wildlife Service (FWS) reclassified captive chimpanzees as an “endangered species,” conforming to their status in African range habitats. Protecting them from exploitation by the entertainment and pet industries was among the goals of this move. As this article went to press, the implications of the FWS “uplisting” were being tested in the case of the Yerkes National Primate Research Center, a private laboratory in the state of Georgia that, no longer allowed to conduct research on chimpanzees, had arranged to send seven of them to an unaccredited zoo in England. The lab’s application for a permit to make this transfer—a requirement of the Endangered Species Act—was approved by the FWS in April 2016 against the wishes of animal-welfare groups and 25,000 people who made comments during a public feedback period. On April 25, the New England Anti-Vivisection Society filed suit against the FWS, prompting a federal judge for the District of Columbia court to question whether the permit would “enhance the survival” of the chimpanzee species, as required by the Endangered Species Act. While the case is pending, four U.S.-based sanctuaries have offered to take the Yerkes chimpanzees. 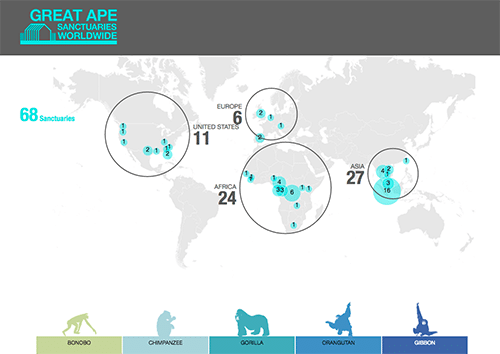 Click to open an interactive visualization of great ape sanctuaries worldwide. The National Institutes of Health announced in November 2015 that it was no longer necessary or ethical to hold in reserve 50 chimpanzees that it had originally planned to save for future research needs. Still, more than 600 chimps remain in federal and private labs. With Animal Protection of New Mexico and The Humane Society of the United States playing a coordinating role, 19 chimps were transferred from Texas Biomed to Chimp Haven, the Louisiana-based federal sanctuary, in early 2016. Nine chimpanzees and four orangutans are still held in the entertainment industry, and about 166 are being kept in roadside zoos, by breeders, or as pets—many of them former “actors” who have been discarded, according to PETA. In 2016, PETA filed an Endangered Species Act case against the Mobile Zoo, in Alabama, resulting in the release of Joe, a 27-year-old ape who had been turned over to the zoo in 1999 by a notorious Hollywood trainer. Joe had survived solitary confinement for more than 17 years while visitors threw peanuts at him, and he pulled out his own hair from boredom and frustration. The Mobile Zoo agreed to Joe’s retirement at Save the Chimps in exchange for PETA dropping the suit.